Contract Workers in Delhi University take to the Street: Theka Pratha aur Jaativad se Maange Azaadi! STUDENTS, TEACHERS AND WORKERS RAISE UNITED VOICE AGAINST CONTRACTUALIZATION OF LABOUR AND CASTEIST PRACTICES AT DELHI UNIVERSITY. Over 300 workers, students and teachers joined at a protest meeting followed by a rally this afternoon to register their discontent/protest over unfair labour practices at the University, taking ahead the case of the ten sanitation contract workers who were illegally removed from UGHG hostel. 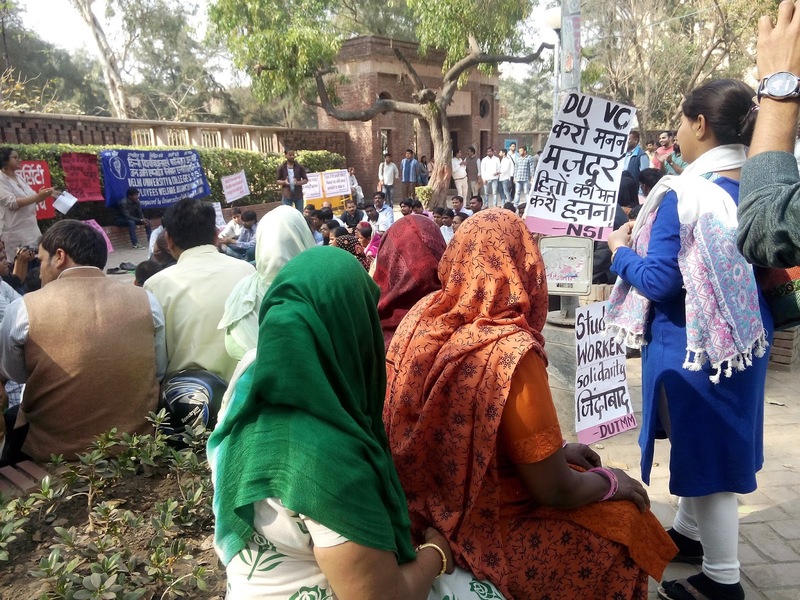 The workers mostly Dalit and women are on protest for last 63 days, and hold complaints against the hostel authorities on the grounds of caste discrimination. The meeting was held on a joint call by Delhi University Theka Mazdoor Manch (DUTMM), Delhi University & Colleges SC/ST Employees Welfare Association, Democratic Karmachari Front (DKF), New Socialist Initiative, DU, Pinjratod campaign and Saamajik Nyay Morcha. 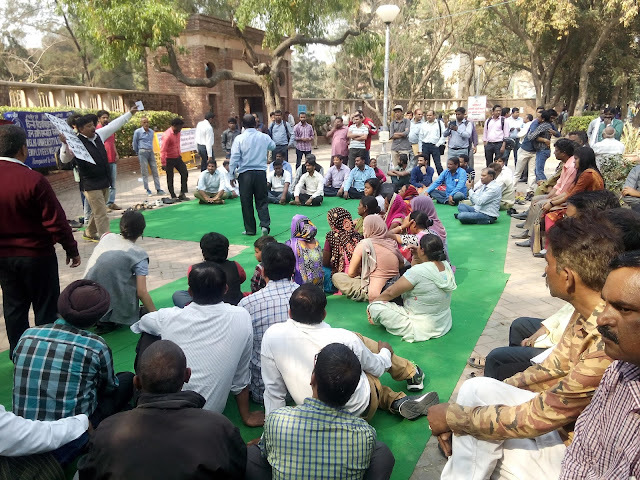 Members of DUKU including the office bearers, Teachers along with DUTA President, various trade union activists and Maruti contract workers’ struggle extended their solidarity. Delhi University Theka Majdoor Manch (a collective of students, workers and teachers) of which the ten contract workers are the members proposed that there may be made immediate changes in the constitution of permanent workers’ Unions and make provision for contract workers to take a united struggle together; given the dwindling number of permanent workers at the University as a result of increased contractualization. Let apart a Union of contract workers at the University, who constitute over half the workforce at the University, there is no redressal mechanism for contract workers. The University administration has persistently abdicated itself from its responsibility as the Principal Employer by recruiting third part agencies for services like security, sanitation, mess, various administrative and technical services etc. that is a work of perennial nature and lawfully qualifies for permanent employment. Workers work for the University for decades with no official documents. 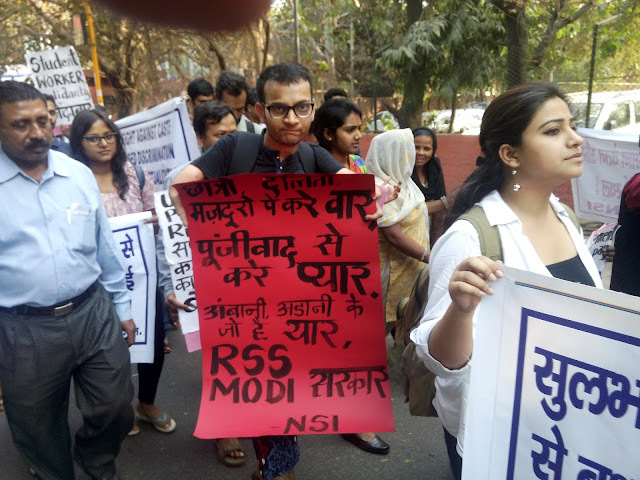 It is appalling that even minimal legal requirements such as minimum wages, ESI identity and health cards, Provident Fund benefits and dignified treatment at workplace have been denied to workers in this university. 1. Reinstate all Dalit contract workers at UGHG immediately. 2. Set up an Inquiry Committee to look into unfair labour practices and rampant caste atrocities in UGHG with fair representation on its board, given that most of the workers are Dalit, Women’s and from other marginalized sections. Until the inquiry committee submits its report, the hostel authorities must step down from their positions so that workers get immediate relief at the work place. 3. Compensate all workers for the loss of wages. Pending wages of over last three years must be paid to them with interest. 4. Implement equal pay for equal work and offer ESI and PF facilities to all contract workers across the University. 5. Regularise all the contract workers who are working for more than six months, employed directly or through any agency and do away with sham contracts. 6. Institute a complaints and redressal mechanism for all workers at the University level. Guidelines for Fair Labour Practices must be immediately enforced by the University. The Delegation constituted of different organizations, exposed how various contract agencies in the university are exploiting the workers and in many instances paying quite below the minimum wages. Most of the contract workers do not get ESI and PF. The specific case of Sulabh International was brought in light where university has gone in a illegal contract for large number of sanitation workers. Sulabh International claims itself as a voluntary social organization and cannot be brought under any labour law. But they fail to answer why and what stops them to pay at least minimum wages to its workers. 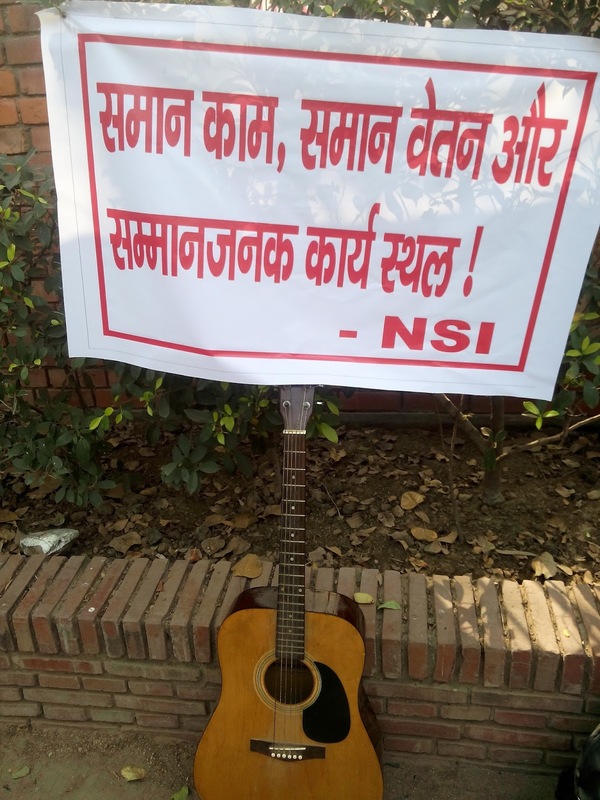 University officials tried to restrict the whole matter as an issue between the agencies and its workers but were told in strong words that as principal employer they are responsible for plight of contract workers in the university. The delegation asked the Proctor and University to make sure that they follow labour laws and pay all the workers according to the law. University officials said that they will look into the matter that how NGOs got full time labour contracts and also the complaints of non-payment of minimum wages of other workers. The delegation also criticized the University of not taking up the issue of caste based discrimination seriously. They were reminded of many cases that DUTMM and other organisations had registered regarding the undignified workplaces where time and again workers are subject to caste discrimination. The Proctor has agreed to look into the issue by early next week. Over the question of increased contractualization, the Proctor said that the University is bound to follow the rules put forward by the University Grants Commission (UGC), which instructs Universities to outsource services. This exposes the larger plan of privatization in Universities. The increased trend of privatization has penetrated our Universities from contractualization of workers to selling education to create level playing fields between private and public universities. Our University is just not teachers and students, but of workers who’s labour is constantly invisibilized. We recognize the workers’ issue as our issue. As a University community that debates, researches and engages in the spirit of a healthy environment at the University, we will take the united struggle ahead for enforcing fair labour conditions. 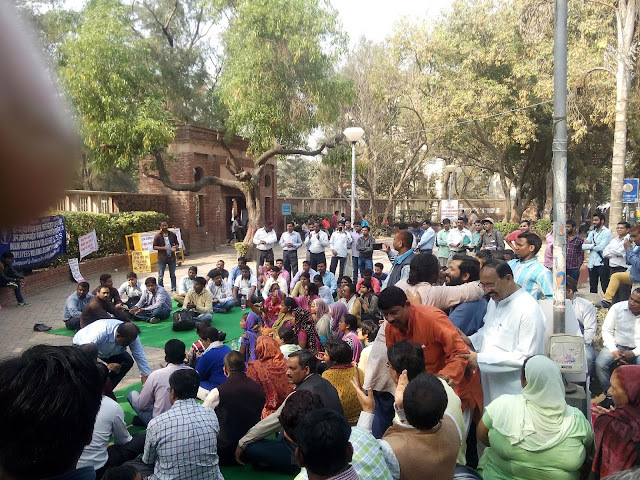 (i) Caste discrimination and unfair labour practices in the University of Delhi: Case of illegal removal of ten contract workers from UGHG, DU. It is with great regret that we bring to your notice yet again the case of caste discrimination and falling standards of employment relations at the University of Delhi. 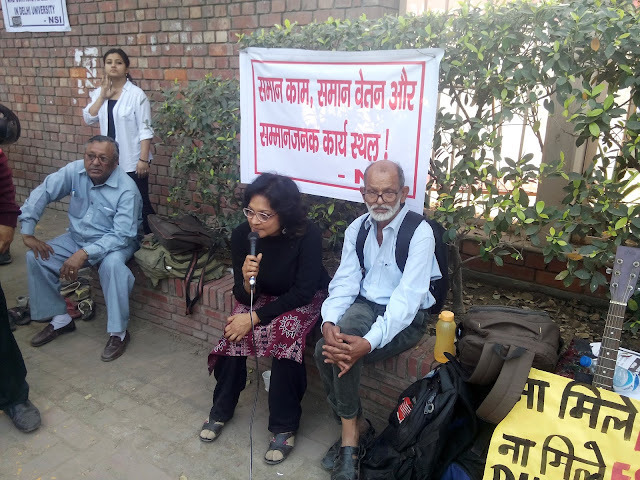 The University of Delhi as the principal employer of many services from sanitation to security has revealed the effects of its authoritarian and casteist approach in many instances. The first eight names are of women sanitation workers, while the last two names are of men sanitation workers. Most of them have been working with the UG Hostel for more than three years without any identity cards or work contracts. Their salaries were paid by the contracting agency. In this case, Sulabh International was the agency which hired them and managed their payments (honorariums, as Sulabh International is a social organization). On the last day of their duty, i.e. 31/12/2015, the Dalit women workers filed a written complaint under the leadership of SC/ST Employees Welfare Association at the office of the Provost. However, the delegation was denied permission to enter the premises of the hostel for more than twenty minutes. Finally when they entered the hostel, the warden and other responsible authorities were not ready to engage with the delegation. On 1st January 2016, the workers (seven of them) were denied permission to enter the hostel. The security guard was given a slip with names of the above mentioned workers to make sure that they stay out of the hostel campus. The protesting Dalit women workers are members of Theka Mazdoor Manch. Since 1st January 2016, Dalit women workers have been on an indefinite protest just outside the gate of the UG Girls Hostel. Additionally what was also reviewed was the official complaints lodged by Dalit women workers addressing the National Commission for Scheduled Castes, Assistant Commissioner of Police (North West District), Station House Officer (Mukherjee Nagar Police Station), Deputy Commissioner of Police (North West District), Chief Minister, Govt. of National Capital Region, Superintendent of Police (Police Headquarters, ITO, Delhi) one can clearly understand the reasons for these dismissals. A written agreement signed by the Provost, Prof. Rita Kakkar and the Resident Tutor, Snehalata Negi duly attested by the provost, dated 4th March 2015, stating that the ‘Safai Karamcharis currently employed in the hostel would be retained on renewal of the contract on contracting of a new contractor’. (a) One worker is assigned one building, which has four floors, toilets, baths and common seating areas. It takes nearly two to three hours to clean, sweep, mop, dust, and scrub one floor. This would mean at least 12 hours of work to finish one building. (b) Apart from the individually assigned buildings, workers are supposed to clean the offices and dining halls. The toilets in the offices are scrubbed and washed by the Dalit male workers. (c) The work begins around 8.30 am and ends when it ‘ends’. (d) At 11.00 am there is a short tea break and then a lunch break. No other break is entertained by the supervisor. (e) The Dalit workers had no rest room for a very long time. They had to fight for a room. Ultimately a room near the pantry was assigned to the workers. (f) They do not have any holidays. Neither do they have any paid leave or Health Insurance. Provident Fund and other benefits of ‘workers’ is a far cry. One needs to contextualize the lack of social security and employee benefits in the radical privatization of labour in the past three decades, aided and blessed by the neo-liberal policies of the State. 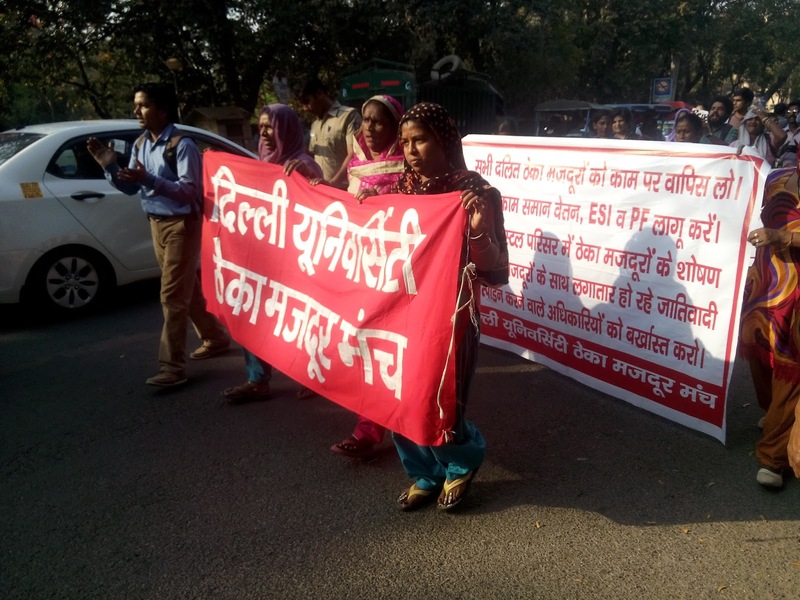 In the case of Dalit-Bahujan workers involved in social reproductive labour, the onslaught of contract regimes has meant a rapid deterioration in life choices and total denial of their status as a ‘worker’ with bargaining power. We are witnessing a happy marriage between university policies of contractual labour and caste system. 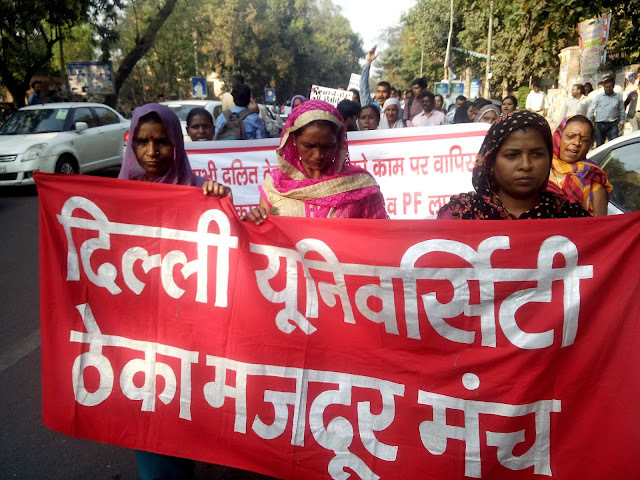 This collusion is producing the worst impacts for Dalit-bahujan women workers. (g) A multitude of occupational health hazards are a part of their everyday life. Several women workers mentioned being affected by typhoid. They point out that the nature of their work affects their health. (h) Apart from on the work in the hostels, offices and dining halls; the workers are also expected to provide free labour at the residence of the Provost and Resident Tutor. There have been instances when workers are marked absent for denying working at the residence of the provost. Every week, at least two workers were ordered to clean and dust the antiques at the Provost’s residence. Similarly, they were made to scrub and mop the floor of the provost’s residence every week. (i) The payment of salaries has been extremely irregular. Initially they were paid Rs 6400/month. Later it was increased to Rs. 8500/month. The workers note that there are disparities in salaries among contractual sanitation workers, based on the contracting agency. For example, in the same UG girls hostel campus, certain workers are paid Rs. 11000/ month while certain others are paid less than 6000/month. (j) The workers no have easy access to medicines in the hostel in case of emergencies. Prior to the incident, there have been several instances of dismissal in the hostel. However what makes this incident different is the fact that 10 workers were dismissed together; making this a case of mass unwarranted dismissal. The workers gave detailed accounts on the context of earlier dismissals and how they are connected with the present incident. 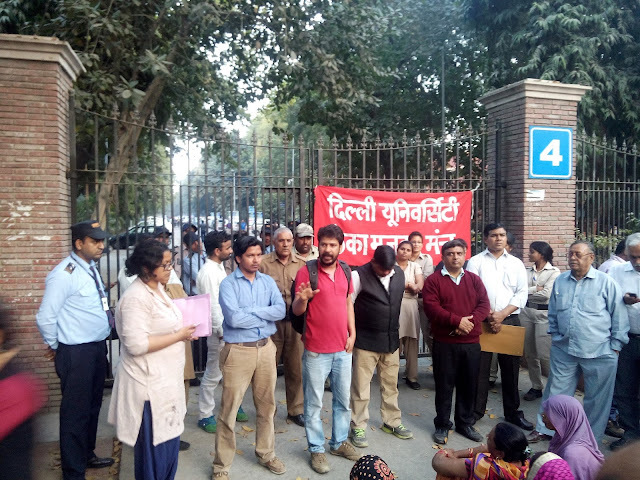 The workers have been harassed through casteist provocations and have been made to work in the houses of the hostel authorities over and above the duties mentioned in their contract. 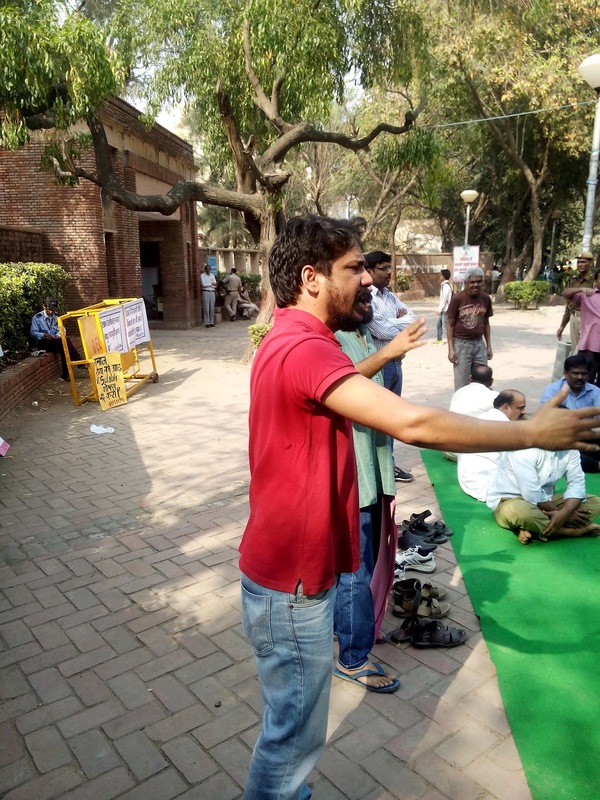 In the wake of questioning the Brahmanical foundations on which these institutions reinforce and reproduce structural inequalities year after year, we stand together to ask for the following demands, which are not only crucial but extremely important to address human dignity. These demands have become even more urgent, as the indifference to the history of humiliation and victimisation of workers has catapulted into the workers facing a crisis at UGHG today. 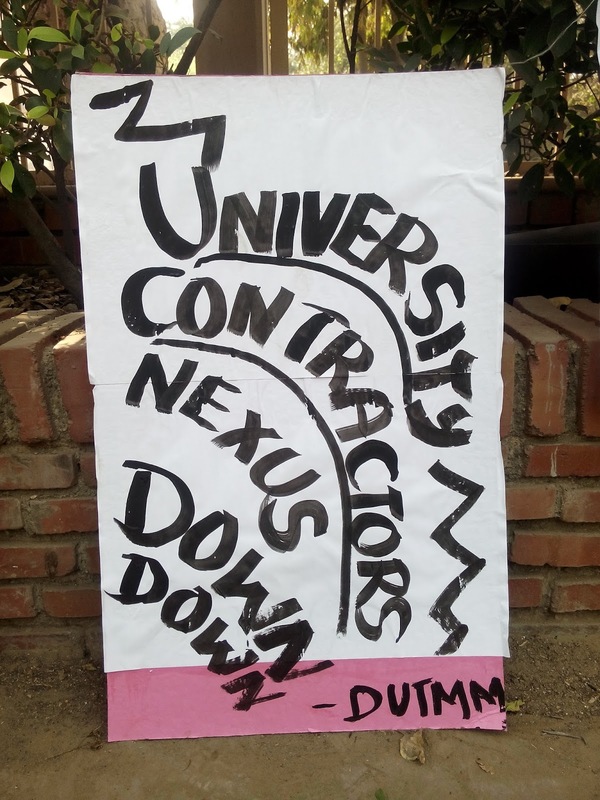 The University has completely abdicates itself from responsibilities towards ensuring even the basic legal rights of the workers by recruiting third party agencies/contractors for work that is neither short term not sporadic. Despite being the principal employer, the university does not check the flagrant and frequent violations of labour laws. Apart from serious erosion in employment and labour practices within the University of Delhi, the labour enforcement machinery has hit its lowest in the current times giving rise to increased precariousness of work. Despite the perennial nature of work, the university has replaced permanent employment at all levels within the university, from teachers to class IV employees violating the Contract Labour (Regulation and Abolition) Act, 1970. Contract workers currently work under constant and realised threats of dismissal, victimisation and harassment. What is appalling is that even the minimal legal requirements such as minimum wages, ESI identity and health cards, and dignified treatment have been denied to workers in this university. We urge you to immediately hear our demands and put an end to the modern day slavery that is being rampantly practiced in the University. As a university community that teaches, researches and discusses justice and human dignity, our strength lies in our collective resolve to be a part of a better workplace. We make it loud and clear that we do not support these illegal, unfair and casteist labour practices and urge you to make concrete efforts towards the same or else the same crisis will manifest itself in new sites of the university and in greater degree. There is going to publishes out Delhi University Cut Off 2017 today very soon. You all students are advise to check out Delhi University Cut Off 2017 from here.